Ok, this might not actually be a standard issue military coat – but I’m in need of names for these articles of clothing, and the little shoulder straps always make me think of the military. So, this is a blue utility coat with four front pockets. It has little shoulder straps. It does up with both buttons and a zipper. It looks black when wet, blue most of the time, and green sometimes. It has a seam straight down the back of it. 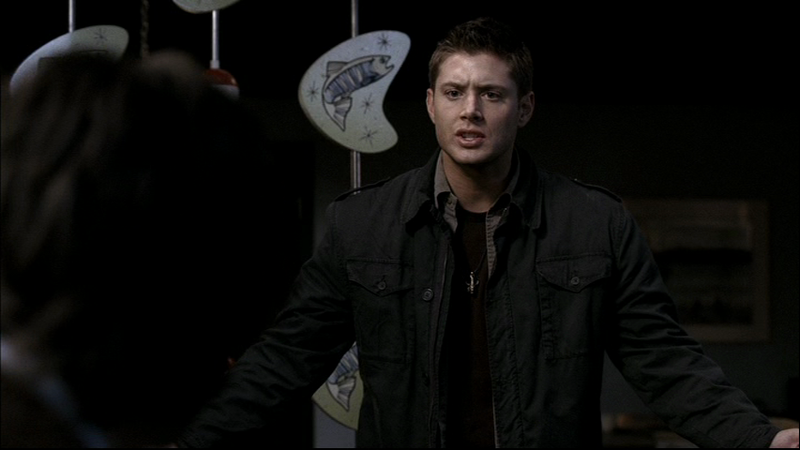 It first appears in Born Under a Bad Sign (2x14), Dean wears it for the entire episode. He takes it off briefly in the motel room before they retrace Sam’s steps. After Sam shoots him in Duluth, he also takes it off so that Jo can fish the bullet out. In Long Distance Call (3x14), puts it on when he storms out of the motel room in a huff after Sam lamely suggests he tell his father “hello” the next time he calls. He is still wearing it when he gets back and keeps it on until Sam kills the monster. He is not wearing it during the closing scene with them in the motel room. In Monster Movie (4x05), this might be the coat that Dean is wearing at the beginning of the episode as they enter Pennsylvania, and at the very end of the episode once he’s been successfully un-hymenated. 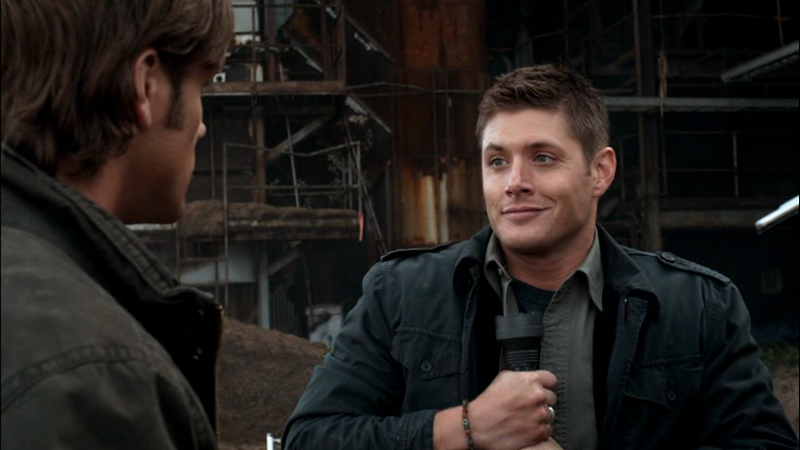 In Yellow Fever (4x06), Dean wears it to check out the saw mill with Sam, even though he is very very scared. 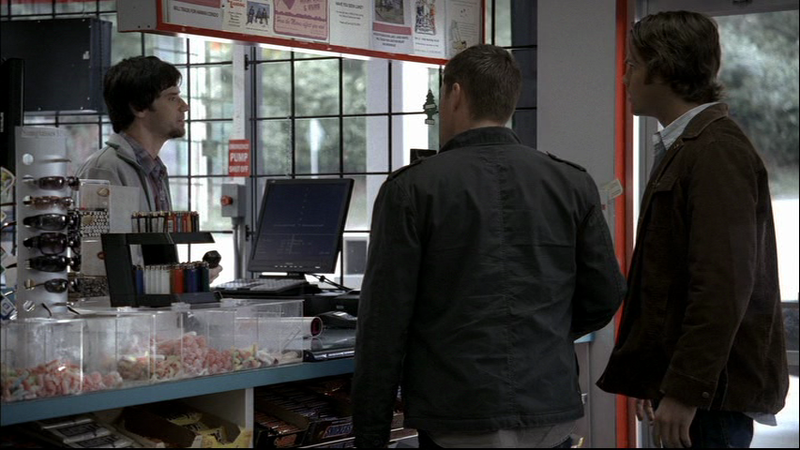 In Fallen Idols (5x05), Dean wears it in the beginning of the episode as Sam and he drive to Canton, Ohio. There is then a substantial portion of the show done in a suit, and then inside the motel room where he doesn’t need a coat. He wears it again when he and Sam head to the wax museum to ask the curator questions, and then keeps it on until it’s time to wear a suit again to interview the housekeeper. He puts it back on again when he is packing up thinking that the job is done. He keeps it on until Sam kills Paris Hilton. In Changing Channels (5x08), Dean wears it during the opening theme song when he and Sam are riding various bikes in the park. In Two and a Half Men (6x02), Dean is wearing this coat when he arrives at the meeting point in the morning to join Sam on the hunt. He wears it for the rest of the hunt with Sam, only taking it off when he is inside the hotel room. He does not wear it once he is back home with Lisa. In Slash Fiction (7x06), Dean wears this coat when he and Sam drive to Frank’s place. He keeps it on until the leviathan doppelgangers are dispatched. In Party On, Garth (7x18), Dean wears this coat for the entire episode, except when he is in a suit, and the first two times he is in the motel room he either doesn’t have it on or takes it off and then puts it back on again when leaving. One of my favorite of his jackets; possibly 'cause my dad used to have one similar to it. Hey, I've been seraching this jacket for a long time, but I can't find it under the brand Banana Republic. Does anyone have an exact model name? It would be greatly appreciated.